Relax in paradise. This is resort living at its finest. Our place is a 5 minute walk to 4 Ocean Lagoons, Paradise Cove Luau, Four Seasons Resort, Aulani Disney Resort, KoOlina Golf Course, KoOlina Marina, open air restaurants and shops. Our place is good for couples, solo adventurers, business travelers, and families (with kids). Our condo is in a secure, gated community. The community offers 2 beautiful pools, one with a sand bottom, and a hidden spa. Come and leave the stress behind. SPECIAL DISCOUNT for Long-term rental 6 months or more. Note: Price does NOT include 13.962% Hawaii lodging taxes. Cleaning fee includes mid-month cleaning. We can only rent to one party during a 30 day period. Please contact us to see if your dates are available. Strict NON SMOKING POLICY, including the Lanai. A fee will be charged if not adhered to. Gated. Secure community. No smoking on or in the property. Quiet hours are 10pm to 8am. Available to one party each 30-day period. Reach out to us with your travel dates and we'll let you know rates and availability. Relax in paradise in the much sought after Coconut Plantation. This is a gated community providing 24 hour security. 2 pools (one sand bottom) and 2 spas available within the development. Each bedroom has Flat screen TV with basic cable. Sip your favorite beverage on the huge lanai overlooking the lush tropical gardens of the secluded hidden spa, a very tranquil setting. Full size washer and dryer in the condo. The kitchen is fully equipped ready for the chef at heart. Central air, ceiling fans throughout the condo. Nice tropical cross breeze throughout the condo can be felt with windows open. Private and quiet with a beautiful view off the lanai. Sip your favorite beverage while listening to the sounds of nature. 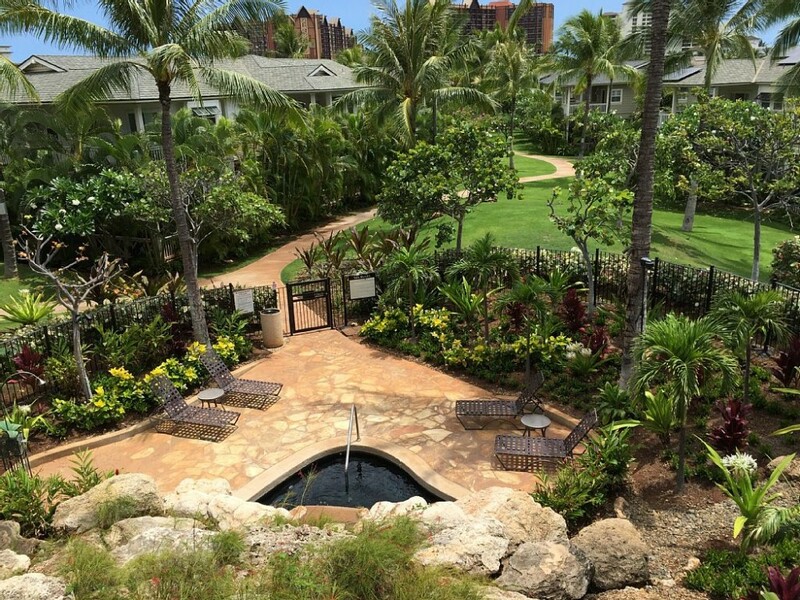 Coconut Plantation is a gated secure community within the Ko'Olina Resort. Walk to the 4 ocean lagoons, Four Seasons Resort, Disney Resort, Paradise Cove Luau, Marina and Golf. One block to open air restaurants, shops and a convenience store market. Leave the car behind. We live close by and will be responsive to your needs. This is a quiet neighborhood perfect for relaxation. There is a walking path along the 4 lagoons. The marina offers day boating trips for snorkeling, sight-seeing and deep sea fishing. An 18 hole golf course is steps away. Within driving distance is shopping, movie theater, and a water park. You can rent a car at the Marriott Beach Club nearby if you only need one for a few days during your stay to see the Island. The speedi-shuttle will take you from the airport to KoOlina for a fee. Reservations required for the shuttle. Priced does NOT include Hawaii tourist tax of 13.962%. This is added to the nighty room rate only. Electric Bill above $150 per month will be charged to the guest. owner will pay up to $150/month for utilities. PayPal or other add 3% processing fee.